What a great title, sounds like a visit to a 1970s disco! Fortunately for my back it wasn't and it was a test I have been dying to do on the truck. 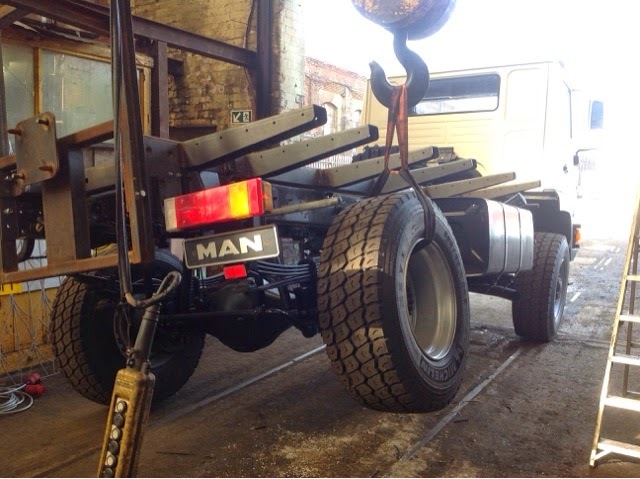 The two chassis rails on the MAN are designed to twist over rough ground as an integral part of the truck suspension. 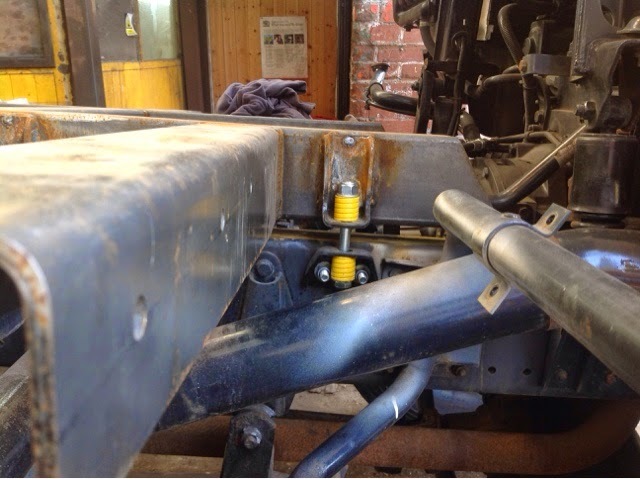 When I build my camper body on the back I don't want all of that torsional stress pulling it apart so I am installing a torsion reducing subframe. (If you want to see a great explanation of this look here Steven explains it and more better than I ever could) The principle of mine is fixed at the back and using springs to allow twist. My worry is to allow enough twist to avoid damage and still give an acceptable ride. 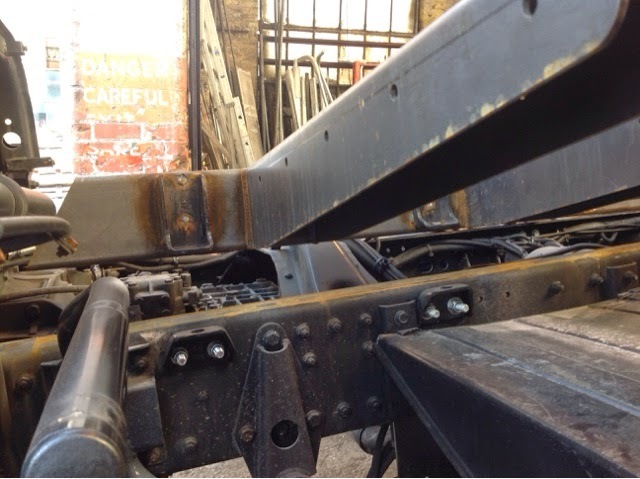 I am waiting for a slot at the galvanisers for my sub chassis and needed to remove all of the fixings so used the 15 ton hoist to twist. Yes that wheel is 450mm off the ground. I am not just playing about I measured the deflection with and without the springs. This was my biggest surprise without springs the two chassis parted 104mm at the front with the rear wheel 450mm (where the other two adjacent wheels were about to lift) from the ground. With my current spring set in place the front set bottom out at 35mm separation at a lift at the rear wheel of 250mm. This was interesting as the strength in the sub chassis lifted the other two wheels and the whole truck came swinging towards me. 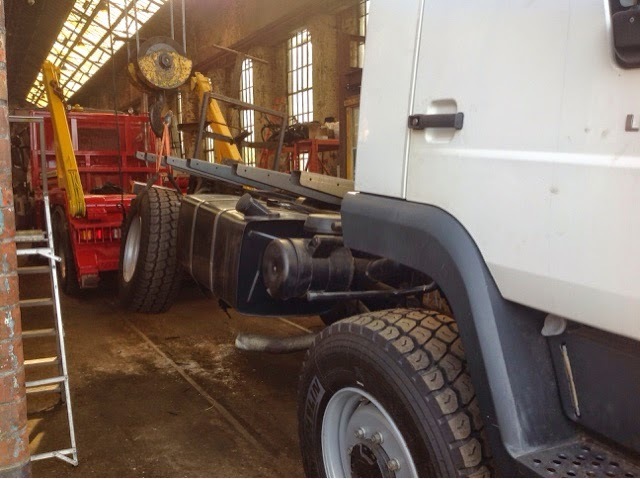 NB must ensure the hoist is vertical next time. As a result of my testing I am happy with the compression strength (is that the correct term?) of my springs. 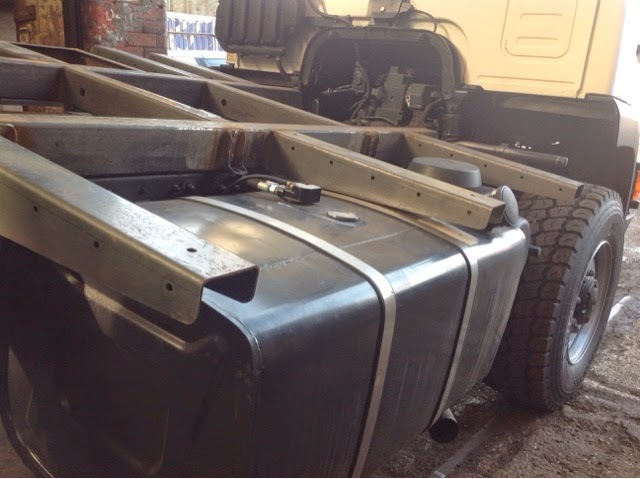 I would like the front springs to bottom out at about 80 mm this will give a range of movement to allow cabin protection but not hit the fuel tank or battery box. I thought we were keeping my name out of this!